Where do Mission hipster meet Marina and Marin, Art students talk to med students, Djs dance with promoters and models drink whiskey with scientists? MANIC MONDAYS is the epitome of San Francisco. 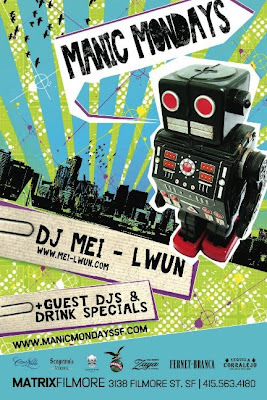 Resident and host Dj Mei-Lwun + weekly guests DJs and Artists play Hipster-Hop and Electro-Pop. No cover. Come with a smile. $4 Fernet $7 Fernet and a beer or Corralejos! We offer bottle with wine starting under a $100 for a reserved table, a few friends and a bottle of wine and you are pimpin sf steez!! Aug 17th Fire on the decks. J Espinosa with your MANIC MONDAYS resident and host DJ Mei-Lwun. The dance floor might melt with this duo rocking the decks from 9pm till the lights come on. Fernet and Corallejos on special. No Cover. Dress to express.